This bird came by for a visit. I think is a type of hawk or a falcon. Can anyone identify it for me? We have been trying but can’t seem to figure out what kid of hawk this is. 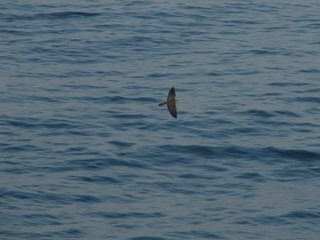 In any case, it stopped by and perched on the bow just out of the blue when we were about 80 miles from shore. I wonder how it got here? Was it blown out to sea by a storm? Did it follow a ship looking for food? Is it lost? I hope it finds its way back. It was foggy during the early morning and the ship had to blow its fog horn. I found out that ships use a code when they sail. One long blast means we are steaming ahead. One long and two short blasts means we have equipment such as nets in the water and cannot manuver as quickly. Listen by clicking here. We found more spoon armed octopi. Can you see that one of the arms has a little spoon like object at the end? The male has an arm shaped like a spoon. Can you see it in this picture? 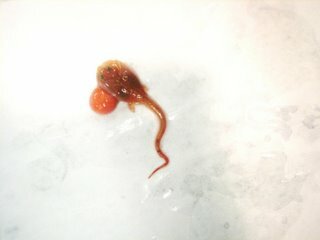 This baby skate has a yolk sack still attached to it. 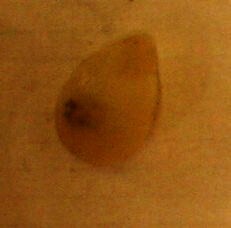 The baby uses the yolk as food while it grows. Usually this happens in the skate case. I wonder what happened with this little guy. 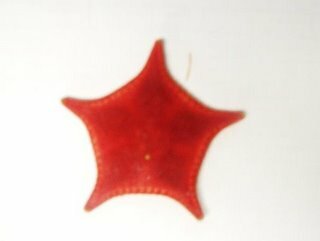 This is a red gold-bordered sea star. 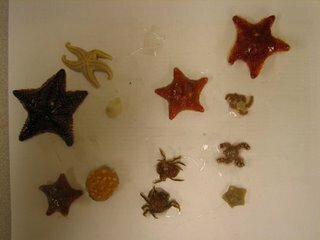 Isn’t it amazing how many different kinds of sea stars there are in the ocean! 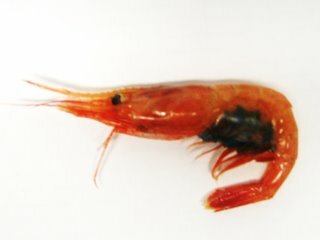 This is a shrimp close up. Can you guess what the blue mass is under her back end? Post your answers to the blog. A sea anemone. 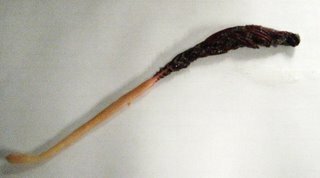 This opens up and tenticles appear. They wave their tenticles in the water to collect food. When fish like Nemo, the clown fish, go into a sea anomone, it will sting the fish, so the clown fish backs in which helps it tolerate the sting. Here is an interesting story: We were approaching a station where we were expecting to take a sample from the water with our nets. 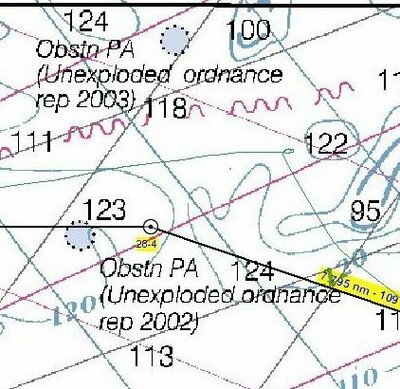 Do you see the note in the chart that says “Unexploded Ordinance?” (you can click on the chart to make it bigger). that means there are bombs from an old ship that may still be active! We decided to move our trawl to a nearby area. When we did, look what came up in the nets! Part of an old ship! The coordinates are Latitude: 42°27’23.65″N and Longitude: 68°51’59.12″E. Here is that location on Google Earth. What could have happened way out here? CLE students, tell me the story of that wreck. Be creative. Please print them out and leave them for me on Monday. Make them fun to read. I am bringing back what came up in the net for you to see. When I get back, we will see if we can do some research and find out what really happened! The main job of a chief scientists is to meet the goals and objectives of the the scientific mission. In our case, that is, to pair up with the ship Albatross in as many stations as possible, following their route. My day to day job is to coordinate with the officers, and crew, setting the nets properly, make sure that the samples are processed properly and solving problems as they arise. Say we have an issue with the nets. It is the chief scientists job to decide what to do next. I can accept the tow, code it as a problem, or re-do the tow. I have to look at each issue individually. If we tear on the bottom, will it happen again? Is there time to re-tow? I also coordinate with the other vessel. My title is fisheries biologist, but I am a specialist in the nets. My background is in trawl standardization. We have to ensure that our nets are constructed, maintained and that we fish same way each time. Small changes in nets can effect how the nets fish and that effects the study. That way we can compare this years catch to next years catch. Remember, this study is called a time series. Over time, you can see changes to fish population. The only way you can trust those numbers is if the nets are the same each time we put them in the water year after year, tow after tow. We have to document what we are doing now so that in the future, people know how and what we were doing. This way the time series remains standard. 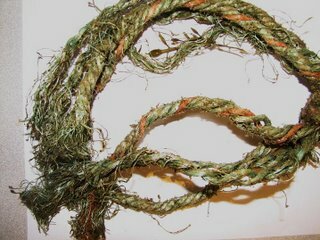 We have to standardize materials the nets are made of, way they are repaired. We inspect the nets each time we come on here. We train the deck crews in the maintenance and repair of our nets. In answer to many of your questions, I will be back to SOCSD on Monday. I’ll be in WOS on Monday and CLE on Tuesday. See you then. We have an engineering department at U Mass and one of the projects they have to do to become materials engineers is to test for hardness and they do an indentation test. Another way is to shoot x rays at shell and we can tell how hard it is by how the x rays scatter. You asked: What is causing the harmful bacteria in the water? We don’t know if they are harmful bacteria. My theory is that it could be the same normal bacteria that are on the backs of healthy lobsters. 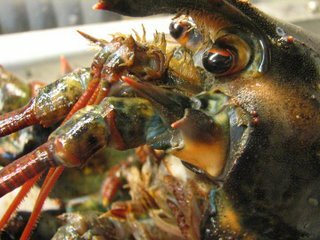 We think it is the weakness in the new lobster shells because of environmental influences south of Cape Cod that causes the trouble. You asked: Can you get rid of the harmful bacteria? It is possible to reverse the environmental conditions that have been created by us or by mother nature. You are right about these sources of pollution. Good thinking. And yes, Dr. Kunkel believes that one or more of these factors may be hurting the lobsters. The problem area is south of Cape Cod. Look on a map today and count the number of cities between New York and Boston. Is this an area with a lot of people and pollution or is this an area that is sparsely populated?How would you expect this area to compare to areas where the lobster population is healthier off of Maine and Nova Scotia? Do the problem areas for the lobster and the pollution occur in the same area? If they match, scientists say there is a correlation between the two and they wonder if one is causing the other. What do you think? Hag fish did gross me out a little. Interestingly, there is no way to determine the age of this fish as there are with others, so I’m not sure we can even tell you how long they live. Several of you asked about the red dots on the lobster. They are a disease. It is called shell disease. The lobster on the right is healthy. I just love this picture so I thought I would share it. SR, the water temperature is about 16 degrees C last time I checked. MF, nice to meet you. It is really cool to be a Teacher At Sea. DTR, my favorite thing about this trip is working with you guys from the middle of the ocean. 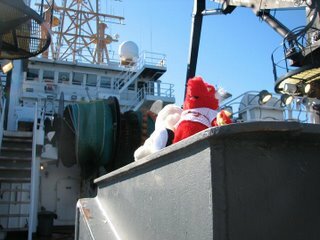 MR, Snuggy and Zee are having loads of fun touring the ship. CF: I will try to count the teeth of a fish and tell you what I find. Sometimes they are hard to see. I do not know if I am going back next year, but I hope so. I like being at sea. The truth is, I like being on land too. Both are nice. Thanks for writing. BS: No, we find mostly adults, but some babies. Many creatures are small as adults. BV: We have seen lots of jellyfish. We had so many we had to hose down the lab at the end of our session the other day. They were everywhere. GS: We will continue to take samples here. TL and Many Others asked how long we put the cups down for: We put the cups down for about 15 minutes. That includes the time it takes to lower the CTD to the bottom. When it gets to the bottom, it comes right back up. Thanks all for writing. Good job calculating all those who got 984 feet! MM, I love the adventures I’m having here and the people I am meeting. It has been fun. I like being on land too. JS, Dr. Kunkel took samples from some lobsters so he could help cure the disease. KF: Could the hag fish bit us? Yes, Mel Underwood, our Watch Chief was very careful as she held the bag and backed her hands up when the fish got close to her hands. Mel is very experienced working with sea life and I have never seen her back off the way she did with this thing. HRF: Go for it! It is a cool job! CF: Good question. No, your bones are a lot stronger than styrofoam, so you would have to go down many miles to hurt yourself, and you could not swim that far without gear. When divers get hurt from pressure changes, it is usually something different called the bends. This happens when you are swim up to fast and certain gases in your blood stream expand as the pressure increases and form bubbles that can hurt you. Divers have to swim up slowly (the usual rule is don’t go up faster than the air bubbles next to you) in order to avoid getting the bends. 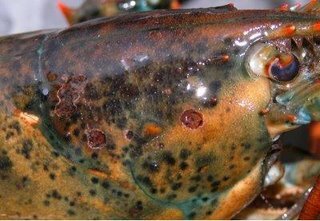 DC: Good questions: The dots are not bacteria on the lobster, they are the result of the bacteria eating away parts of the shell. The actual bacteria are too small to see. Good question about he temperature relating to growth. It is a bit more complex than that. There are many factors at work. The factor that may be causing more bacteria are chemicals like fertilizers from land getting into the water. 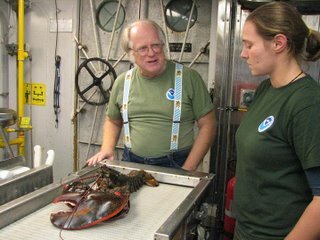 Dr. Kunkel came on board to study lobsters. He is a biologist, not a medical doctor. There are many scientists on board working with us, and me with them. The quadrent is an old invention. People have been able to find their way with the stars for thousands of years. It is an ancient art. It was fun to practice it here. SF, VF and others: The fish stayed in the bag. We made sure of that. From the bag, we put it back in the sea. SD, sorry, I can’t help you there. I don’t think a pet skate would survive the trip back to NY. Several of you have asked if I have gotten sick. No, I have not. How many lobsters have we caught so far? Lots! CP: bacteria infect the shells of the lobsters. This destroys the protection that the lobster should have. They grow weak and die of other causes. Good question! Why do we work at night? Because ships work 24 hours a day so that no time is wasted. I ended up on the night shift. Why do we wear suits? To stay warm and dry on deck. 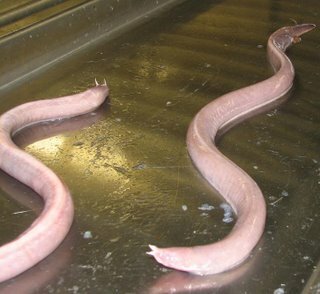 The hagfish eat shrimp and small fish, though they are scavengers and can eat large creatures as well. Mrs. Christie Blick’s Class, you guys are doing some great work. I check on the skates for you. Some skates have protection, like thorns or spikes. They also have some interesting fins that look almost like feet. They use these to “walk” along the bottom searching for food. I know you asked about skates, but I have to mention the ray I worked with yesterday. It is related to the skate and could shock with an electrical charge for both protection and for hunting prey. Cool! Our study of creatures on the bottom of the sea has been done every year for 45 years. In fact, it is the longest series of data for fish, in the world. Why is this important? I asked Dr. Michael Fogarty, head of the Ecosystems Assessment Program, at the Northeast Fisheries Sciences Center in Woods Hole, MA. 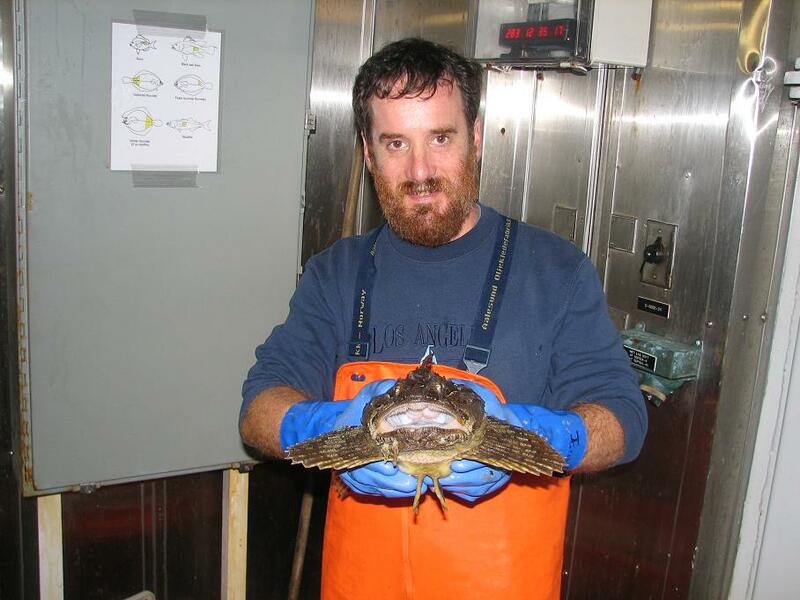 Mr. T: This is the longest uninterrupted time series of a trawl survey anywhere in the world. Is that important? 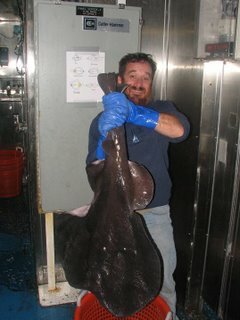 Dr. Fogarty: Really important because the changes that we are observing occur over long periods of time due to fishing and climate and other factors, so we need to track these changes to see how individual fish species are doing and to see how the ecosystem itself is responding to these changes. Mr. T: What have you found? We have found overall in the 45 years that we have been doing this survey, the number of fish has remained the same, but the types of fish have changed. 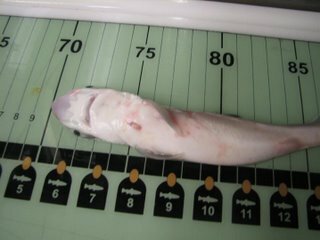 In Georges bank, we would have mostly cod, flounder in the past, now we have small sharks, skates, which are relative of the rays. Mr. T: What does that mean in terms of the ecosystem? Mr. T: Why is that happening? Dr. Fogarty: Our hypotheseis is that because the some fish have been hurt by too much fishing, the other fish have come in to take their place. I thought about that for a while. It means this ecosystem has been effected by something called Overfishing and something called climate change. I started wondering about all the different factors that might have effected the environment we are studying. There are so many! Let’s look at some of the may things that human beings have done that have changed this ecosystem in the 45 years we have been doing this study. Dr. Fogarty and I talked about this and then we created talked about this mini website for you. Click each problem area to learn more. 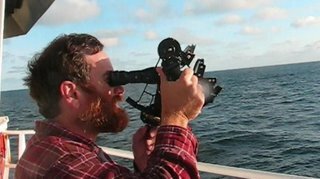 Remember the other day when I tried to use a sextant to fix our position? I could not even get close, so today, I took a lesson with one of the NOAA Corps officers on board, Lieutenant Junior Grade Andrew Seaman. Click here to come along. 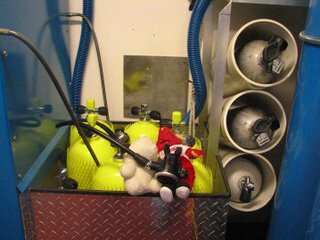 Elsewhere on the ship, Snuggy and Zee paid a visit to the dive locker on the ship. This is the area on the ship where SCUBA gear is stored. We are not using SCUBA on this trip, but it was fun to visit the locker and see all the gear. Snuggy and Zee learned that the crew can actually fill up the air bottles they need right on the ship. They have all the equipment they need to do work underwater right here on the ship. We had a fire drill yesterday. I know you are all familiar with fire drills, because we have them at school. When we do them at school, we often practice evacuating the building and calling the fire department. Well, at sea, things work a little differently. We have to get away from danger, but then, we have to practice putting out the fire as well. After all, there is no fire department to call way out here! Click here for a video. Finally, so many of you asked about dangerous creatures that we have caught. This torpedo ray does have an electrical charge to it. The ray can zap you if you are not careful. I used rubber gloves to keep from getting hurt. The hardest part was holding the thing while we took the picture. I kept dropping it becuase it was so slimy! AT: I have not been frightened by anything on the ship or in the sea that we have seen. The hag-fish did seem gross. Very gross. Other than that, no. Hi SP, I enjoy Korean food very much and have eaten lots of crab roe. It does not gross me out at all. Thanks for writing. NV, Zee and Snuggy are just fine. Thanks for asking. Mrs. B’s Class: I’m glad you liked the blog. We found the dead whale 100 miles or so off of Cape Cod. There are no sea snakes here. The water is too cold. I’m kind of glad about that! Hello Mrs. Graham’s Class. I am staying nice and warm. Even working on deck, it is not too cold. We could stay out for several more weeks without a problem. Do you know what we use to make electricity? See if you can figure that out. We have to go back to port before we run out of that. Mrs. Christie Blick’s Class: Very interesting. Our chief Scientists says that they can tell the whales don’t like barnicles because whales without them don’t behave in quite the same way. This particular fish, which we call a monk fish or a goose fish has all the adaptations you mentioned. You did very well thinking those up. The Chief Scientist, Phil Politis and I are both impressed. He says that the fish hides in the mud (that is why it is brown), which keeps it hidden from predators. It has another adaptation, the illicium which we are calling a fishing rod. This adaptation lures smaller fish to the monkfish. Since it does not move around as much as many other fish, it can stay safer from predators. Hello to Mrs. Coughlin’s Class, Mrs. Berubi’s Class. I’m glad you like the blog. NN, I’ll be back next week. Because the crew and I, as well as a few birds are the only land-creatures we have seen out this far! Thanks for writing. Hi Jennnifer. Thanks for your kind words and thanks for checking in on the blog. Here is Doctor Kunkel collecting samples with Watch Chief Mel Underwood. 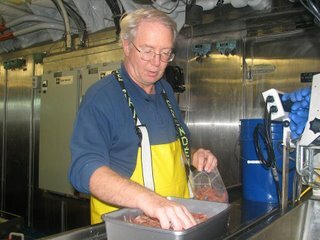 Dr. Joseph Kunkel from the University of Massachusetts at Amherst is investigating a mystery on board our ship. In the last few years, fisherman and biologists have all noticed that lobsters are disappearing from waters south of cape cod near shore. This includes Narragansett Bay and our own Long Island Sound. Why? Thats’ what Dr. Kunkel is trying to find out. He and other scientists have found that the lobsters are infected with a bacteria. Dr. Kunkel has a hypothesis. He believes that some lobsters get the bacteria because their shells are not as strong as other lobsters and don’t protect them as well. He is here collecting samples to test his hypothesis. He has even made a discovery. 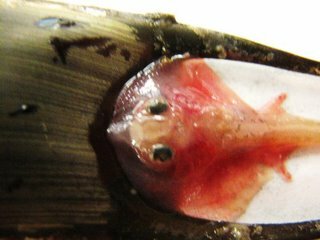 He and another scientist, named Dr. Jercinovic, discovered that this shell fish actually has boney material in certain places in the shell. The boney material helps make the lobster strong enough to resist the bacteria. Effected lobsters may not have as much bone, so their shells are weaker. Why are the shells weaker? There may be a few reasons. The water South of Cape Cod is warmer than it normally is. Climate change may be to blame. The water has a lot of pollution from cities like New York and Boston. There are many streams and rivers pouring into the area that are Affected by acid rain. All of these things may effect the lobsters in the sea. They may effect other creatures in the sea as well. Can you think of things that are happening in our neighborhood that may contribute to this problem? Post your ideas on the blog and I will share them with Dr. Kunkel. 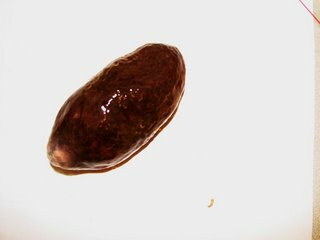 What does shell disease look like? Can you see the red spots on the photo on the right? That is shell disease. It can get much worse. Thanks Dr. Kunkel for sharing your work and your photograph. 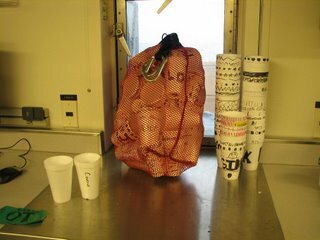 The art teachers, Mrs. Bensen in CLE and Mrs. Piteo in WOS had groups of students decorate Styrofoam cups for an experiment on the ship involving technology, water pressure in science and perspective in art. You probably have felt water pressure. When you swim to the bottom of the deep end of a pool, you may have felt your ears pop. This is water pressure. It is caused by the weight of the water on top of you pushing down on you. Well, a pool is only 10 or 12 feet deep. Just imagine the pressure at 600 feet down. We wanted to do an experiment with water pressure. Since Styrofoam is has a lot of air in it, we wanted to see what happened when we sent the decorated cups to the bottom of the sea. Click here for a video and see for yourself. If you decorated a cup, you will get it back when I come in next week. Here are some more interesting creatures that came up in our nets overnight. We have been in deeper water and some some of the creatures have been quite interesting. This “sea pen” is a type of soft coral. This is a sea-hag. It is a snake-like fish that has some amazing teeth. 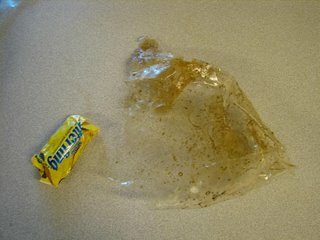 We put one inside a plastic bag for a few minutes to watch it try to eat its way out. Take a look at this video to see what happened. 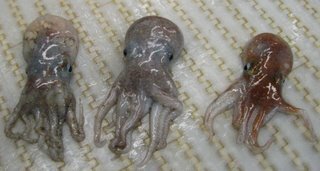 Here are three Spoon Arm Octopi. 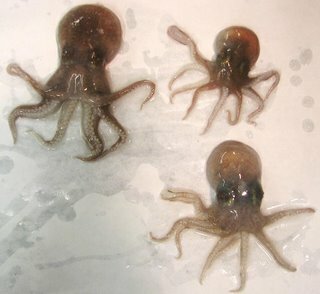 Each octopi has three hearts, not one. One pumps blood through the body and the other two pump blood through the gills. There are three octopi in this photo. How many hearts to they have in all? This redfish are also an interesting criters. When they lay eggs, you can see the babies inside. They live in deep water. We caught this one at a depth of 300 meters. How many feet is that? Here is a bobtail squid and a sea-start. The squid looks like an octopus, but it is not. This skate case had a baby skate inside. Here is what it looked like as the tiny creature emerged. 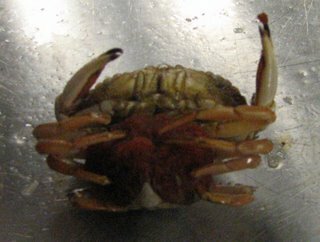 Finally, the red on the underside of this crab are the eggs. 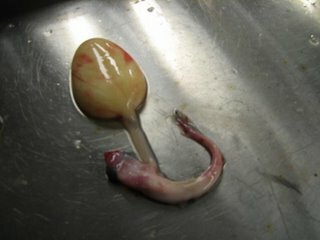 Biologists call them roe. 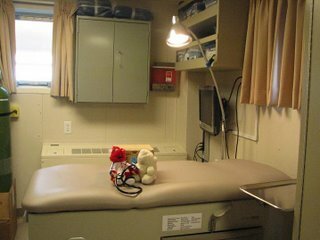 Zee and Snuggy paid a visit to the ship’s hospital to take a look around. The hospital is amazing. They are able to treat a wide variety of injuries and ailments without having to call for help. They can even put in stiches if they need to. In cases of serious injury, however, the Coast Guard would have to take the patient to land with the helicopter or fast boat. Zee and Snuggy had a great time touring the hospital, and all three of us are just fine. Happy Columbus Day everyone, and, since were in Canada, Happy Thanksgiving. Yes, that’s right, Thanksgiving. Here in Canada, Thanksgiving is celebrated on the second Monday in October. So a special note to my son Nicky: Happy Canadian Thanksgiving! Back to Columbus Day, though. Since that’s probably what your all talking about at home. In honor of Columbus Day, I thought I would try something interesting. I made a replica of the instrument Columbus used to navigate his ship. It is called a Quadrant. Columbus would sight the North Star with his quadrant and measure its angle above the horizon. That angle is equal to your latitude. He used a quadrant to measure that angle. This is what a quadrant looks like. You hold it up so you can see the star you want in your site. 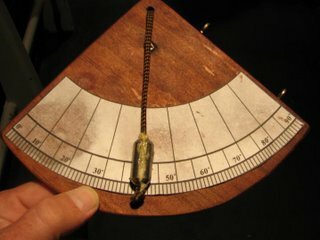 The weighted rope simply falls over the scale of numbers and indicates the angle. What instrument in math looks like this? Post your answers on the blog if you think you know. So did I beat the GPS? You will have to watch this video to find out. Want to try sighting the North Star yourself? Here is how: Find the Big Dipper. Trace an imaginary line from the spoon up. The first bright star you come to is the North Star. Want to find our more about using the stars to find your way, or Celestial Navigation, click here. We are fairly far out to sea right now. There is a point of land in Nova Scotia, Canada about 100 miles to our north, but most land is around 200 to our west. We are seeing a lot of off-shore birds like the Shearwaters pictured here. These little birds spend most of their lives in the open water feasting on fish. They come on shore only to breed, so landlubbers don’t see them very much. What a treat. They were part of a large flock that was foraging in the nets yesterday afternoon during a tow. We also have a few land birds on board. They may have been blown out to sea by storms and have stopped on our ship for a rest. Several were eating what they could find out of the nets on deck yesterday. The nets on the Bigelow have 6 sensors, each reporting different variables, such as depth, the width of the net opening and the height of the opening back to the scientists on deck. One of the sensors stopped working and had to be replaced yesterday. Take a look at this video of how the repair was done. The water temperature outside is changing. It is now much colder than it was. When we were further west, we were towards a warm current called the Gulf Stream that moves north along the east coast of the USA. The water was about 63 degrees. Now we are in a cold water current called the Labrador Current. This current brings water south from the Arctic along the Canadian coast and ends in the Gulf of Main. The water here is about 55 degrees or so. We are not seeing the dolphins anymore and some of the science crew thing the water temperature may be too cold for them. Take a look at this map of the water temperatures. Brighter colors are warmer in this picture. We have moved from the warmer greener colored water into the cooloer blue colored water. The red line represents our course. WOS students who have not had a chance yet, should compare our ship to the one Columbus Sailed. Go back and look through the blog at the pictures of Snuggy and Zee in the different parts of our ship to help you. Post your answers on the blog. Finally, something very interesting came up in our nets today. We got this off the bottom in 1000 feet of water. It is wood. Clearly cut and shapped by a person and for a purpose. It appears to have been down there for a long time. How do you think it got there? Post your answers on the blog! CLE students, try using these images of ships in the past as a story starter. Write me a short story about a trip on an old sailing vessel and incorporate some of what you have learned about their technology in your story. Can you tell me the story of how that wood ended up on the bottom of the ocean? Please don’t post these to the blog. They will be too long. Print them and show them to me when I get back on land next week. 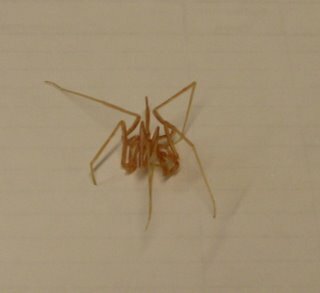 RM – Good question: A sea spider is a sea-creature related to the horseshoe crab. It just looks a lot like the spiders we see on land. Have we seen any sharks? We have seen a lot of dog-fish, which are a type of shark, but are not very ferocious. Our captain saw a great white off the bridge. Unfortunately, I was working below decks at that moment and did not get out to see it in time. Here is a sample of what has come up in the nets overnight. 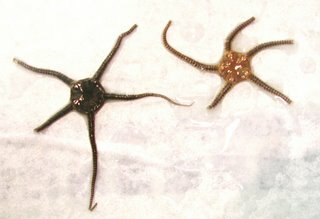 Here are several different types of sea-stars. I am always amazed by the wide variety of these creatures that exist in the ocean. This little fellow might not look like much, but it has an interesting history. This creature is called a brachiopod. It belongs to one of the oldest family of creatures on earth. There have been brachiopods in the sea for at least 550 million years. That is long before there were even plants on land, let alone animals and dinosaurs. It is a simple shelled animal that has a single stalk that helps is stay attached to the rocks around it. Click here to learn more about this amazing creature. 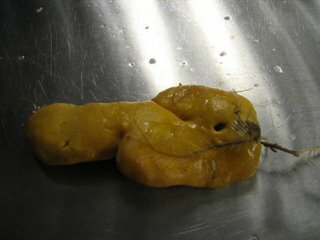 Here is a sea cucumber. They live at the bottom of the sea and can be found all over the world. They are used to make medicine in some countries in Asia. 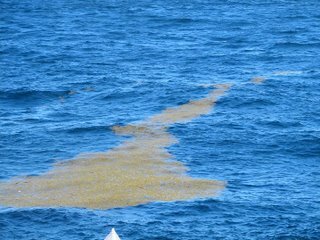 Remember that large raft of sargassum weed we saw yesterday? Some came up in the nets today. Here is what it looks like close up. She the little pockets that hold air? 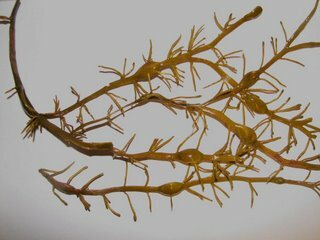 They help the sargassum stay afloat. This is a sea spider. And of course, there is always garbage. We keep getting bits and pieces each time the nets come up. Here is a sampling. We found one entire Butterfinger candy bar with the chocolate still inside (no, we did not eat it), as well as some rope. How do you think it got here? Let take a closer look at a sensor called a CTD. That stands for conductivity, temperature and depth. Remember the drifter buoy that we released a few days ago? It measures temperature on the top of the water and it can drift all over the ocean taking readings. A CTD takes its measurements as it descends through the water column and can go all the way to the bottom. Have you ever seen barnicles move? They do. We found these huge barnicles in our net and we put them in water to encourage them to come out. Check out this video! A lot of people have asked me about sea-sickness. Sea Sickness happens when your brain and body, which are constantly working to keep you balanced, get confused by the rocking of the ship. It is a terrible feeling, and I’m glad I have not been sea-sick at all on this trip. Some people do better than others on boats. I do not tend to get sea-sick unless the waves are very high, and I am used to the rocking of the ship now. The other night I was working on deck and I caught sight of the moon moving quickly across the sky. I wondered why it was moving so fast until I realized it was my ship that was moving in the sea and me with it. The moon only seemed to move. I guess that means I’m used to the rocking back and forth and hardly notice it now. MLL, SPL and MCL, Snuggy and Zee are having a great time and none of us are sea-sick. I put more information about it in the upper part of the blog entry. Thanks for writing. SQ, CS, KM and VM: It is nice fall weather. Not too hot, not too cold. I love it. I have not felt uncomfortable even when I am working out on the wet deck of the ship. GG: It is not hard to sleep at all most nights. There was only one night where the waves were high and I bounced around too much to sleep well. The rest of the nights were fine. The ship rocks me to bed at night. I do miss WOS. See you soon. Greetings from Canada, my son Nicky’s favorite place! We are now in Canadian waters. We have crossed the international boarder. More amazing things keep coming up in our nets. 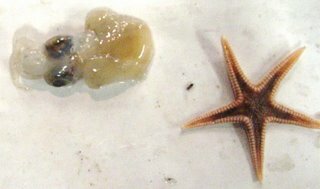 Today we had some interesting sea-stars. Take a look. 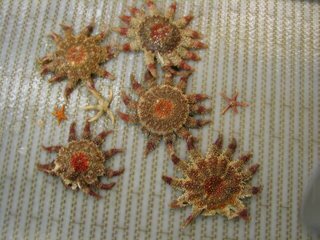 The larger ones are called Sun-Stars. Do they look like the sun to you? 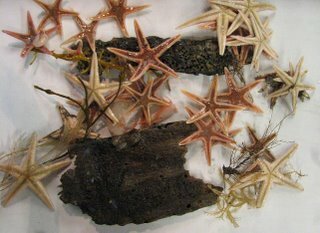 Sea stars are scavengers. They will move around the bottom looking for whatever food is laying around. 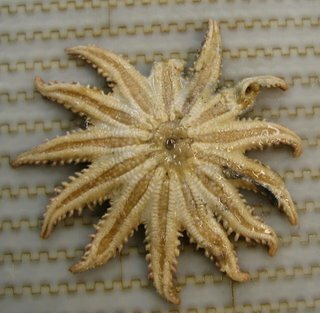 The legs of the sea star have small tentacles that push food towards the mouth in the center. Can you find the mouth? Did you know that squid can change color? 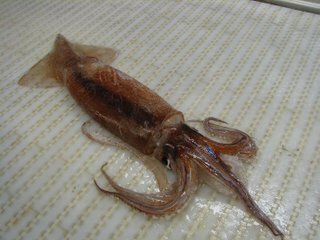 Often male squid change color to attract a mate or to scare off other males who are competing with them. If there are two males near one female, they able to turn one color on the side facing the female, and then turn another color on the other side facing the male. We had more dolphins circling the ship last night. We think our lights may be attracting certain fish or squid, then the dolphins come to eat that. They are not with us during the day at all. One of the benefits, I guess, of being on the night watch. I cannot shoot still photos due to the low light, but have wonderful video. 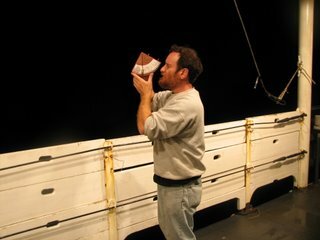 The sounds that you hear on the video were recorded with the ship’s hydrophone. This is a special microphone that can record sounds underwater. The sounds were recorded as the dolphins swam around the ship. You can hear the sound of them swimming by as well as the sound of their sonar as they locate fish to eat. Click here to watch and listen. Thanks to survey technician Pete Gamache for recording this for us. Click here to see the video. Don’t miss it! We drove past some seaweed called sargasum weed. It normally grows in an area towards the middle of the Atlantic called the Sargasso Sea. We are well west of the Sargasso, but this seems to have drifted our way. 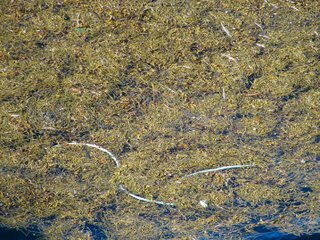 Sargasum Weed grows on the surface of the water. These huge mats of seaweed support an entire ecosystem of sea creatures. Many come to seek shelter in the weeds. Many more come to feed on smaller creatures hiding there. Snuggy and Zee paid a visit to the fantail of the ship. The fantail is an area by the stern of the vessel where the nets are deployed. The photos show the area where the work gets done. Our ship works all night long, of course, and trawls are done at night as well as during the day. Take a look at this video which explains how trawls are done. 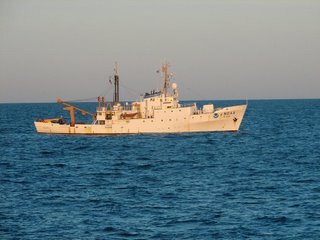 Our ship is shadowing another NOAA ship, the Albatross. Why? The Albatross is an old ship and will be replaced by the Bigelow in the years to come. At this point, the ships are trawling in exactly the same place to see if they get similar results in their surveys. Making sure the vessels measure the same thing the same way is called calibration. Right now we are doing calibration with the Albatross. RM – No we did not see Nantucket yet. We were too far out to sea. We may see it on the way back. Thanks for writing. T – I love Block Island too. Thanks for the warning about rough seas. I am glad you and your mom are both enjoying the blog as much as I enjoy writing it for you. I’m used to the 12 AM shift now. I that I finally got 8 hours of sleep. AR – There were TONS of skates in the water. — Amanda, I think fish can get smaller pieces of plastic confused with tiny plankton, but our buoy is too large for that. I don’t think it will hurt fish. I think they will stay away from it. –Tiffany, this is a tough question and a very good question. I guess over time, our buoy will stop working and will become floating trash. The truth is all science effects the environment you study. The trick is to do more good with your work than harm. Our buoy will help us understand our environment better so that all of us will do less harm in the future. Our ship also burns fuel as we study the ocean. That pollutes a little, but hopefully through our work, we do more good than harm to what we study. Weston, It felt like the drifter weighs about 35 pounds or so. Bryce, we use a large net to scoop along the bottom. The opening is about 4 meters wide. Luke, we have not, nor do I expect to find new species. Our purpose is to learn more about the species that we already know about. Bryce, we were about 140 miles from the nearest land the last time I looked. RJ, some scientists made our drifter. Weston, there are about 1000 drifters right now in the open sea. I enjoyed your questions. Thanks for writing. Mr. Moretti’s class, I’m not sure what killed the whale, but remember, all things the live also die. We cannot assume that something human beings did killed that whale. With all the pollution we create, we cannot assume, however, that we did not hurt it. We should stop polluting just to be sure we do not hurt other living things. Many of you have are working hard to figure out our math question from the other day. Here is how it works. If we are going 8 knots for 24 hours, we multiply 8 times 24 and get 192 knots in a day. If we want to convert that to miles, we multiply again by 1.15 because each knot is 1.15 miles. We get 220.8 Congratulations to all who got this correct. It was a tough question. Several of you have asked how long I would be on the ship. I will be here until the end of next week. I leave the ship on Friday October 17th. LP – I enjoy the show Deadliest Catch very much. I think it is cool that scientists sometimes do that same kind of exciting work. SD, there is no way for me to videotape under that water, but tomorrow I will show you how our sonars (we call them echosounders) work. That is one way to see under the water. DT from SOMS dont’ worry, there is no light pollution out here. I am on the back deck of a working ship, so right where I am there are lights. I need them to do my job. I just have to go to the upper decks to get away from it or ask the bridge to shut them down for a bit. Did you figure out the answer to yesterday’s question? Those creatures were the real cast of Sponge Bob Square Pants TV Show. We saw a sponge, like Sponge Bob, and sea stars like Patrick, plankton, like Sheldon Plankton, some squid like Squidward, a crab like Mr. Krabs next to a sand dollar (because Mr. Krabs loves money), a lobster like Larry the Lobster and a snail like Gary. All the creatures in the program actually exist in the sea, except for squirrels, and we have seen them all on this adventure. Amazing creatures keep coming up in our nets day after day. Let’s take a look at a creature called a skate. The skate makes those funny black rectangles that you find on beaches. Take a look at where those rectangles come from and what is inside of them. Click here for a video! 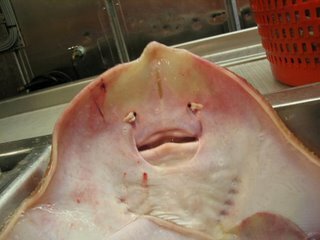 Skates also have interesting faces. They live along the bottom of the sea. Their eyes are on top of their head to spot predators and their mouthes are below to eat what is on the bottom. They have two nostril -like openings above their mouth called spiracles. They look just like eyes but actually help the skate breathe. Here are a few interesting skate faces. This sea robin uses three separate parts of its pectoral fin, called fin-rays to move, almost like its walking along the bottom of the sea as it looks for food. This helps is move very quietly, making it able to sneak up on prey unobserved. These two baby dog-fish show different stages of development. This one is still connected to an egg sack. The other has broken loose from it, but you can still see where it was attached just below the mouth. Usually in this species, just like most fish in the shark family has eggs that develop inside the mother’s body. She gives birth to the pups when they have hatched from their eggs and are ready for the open sea. Many people have asked me about garbage. Here is some of what we have found so far. We caught part of someone else’s fishing net. 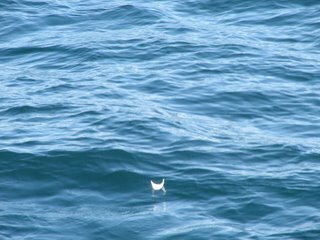 Here is a Styrofoam cup and here is a plastic bag, which we caught 140 miles from the nearest land. How do you think it got here? Finally, we were visited by some dolphins last night. They were eating smaller fish and as they came in for their attack, you can see the smaller fish jumping straight out of the water into the air to try to avoid being caught. Click here for a video. Snuggy and Zee decided to visit the kitchen today. 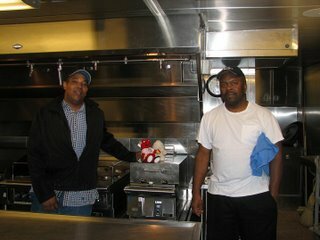 Here are Zee and Snuggy with our chief Steward Dennis M. Carey and our 2nd cook, Alexander Williams. The food here is fantastic. See how large the kitchen is? We have a lot of people to feed on this ship, and the cooks here work hard. You have seen a few of the many different jobs that people can do on a ship like this. You have seen the scientists at work in the labs, you have seen the engineers who make the engine go. You have been to the bridge where the NOAA Corp officers run the ship. You have been to the kitchen where the cooks keep us so well fed. Tomorrow, you will see how the deck crew trawl our sample nets through the water. Keep checking the blog this weekend. There will be lots to see. Hi to KD and to Derek Jeter. We are staying safe. Thanks for writing. If a ship hit a drifter, the drifter would probably be broken. But the ocean is a big place, and that does not happen very often. Can your school adopt a drifter? Of course! Take a look here: http://www.adoptadrifter.noaa.gov/. In the mean time, you are welcome to follow the adventures of our buoy. Keep checking this website! I have Snuggy because some of my kindergarten classes asked me to take a bear with me to sea. So I did! How heavy are the drifters? It weight 30 pounds or so, I would guess. Enough to make me work to pick it up. I knew the whale was dead because part of it was decomposing. We could see it and we could smell it. Yuck. Did any fish try to bite me? Yes. One scallop closed its shell on my finger. I had to be quick to get my hand out of the way in time. Other than that, no. At 8 knots per hour, the ship could travel 192 knots, or about 220 miles in a day. Congratulations to all who calculated correctly. 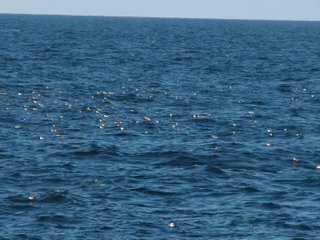 The truth is that we have to stop for sample trawls every hour or two, so we seldom make our top cruising speed when we do work like this. So, we usually travel less than we could. Oh, and to all those who asked, so far I have not gotten sick. Yet. Thanks all for writing. Keep checking the blog!